This is a single-lane road that winds up into the mountains to access the Microondas el Crestón (microwave tower) at the summit. The road is located near Casa Machaya in the neighborhood called Lomas del Crestón, It is accessed from Calle Gerardo Varela just up the road from ISSSTE Hospital and the Fuente de Siete Regiones (Fountain of the Seven Regions). The road first passes a large white cross where people often go to place flowers before it terminates at two microwave towers. Throngs make an annual pilgrimage to the cross. At another time of the year, there are gravel ramps put up between the towers and the cross, and there are downhill mountainbike races...amongst the cows and all. The road is just a single lane so it is best for walking or biking and not for driving. 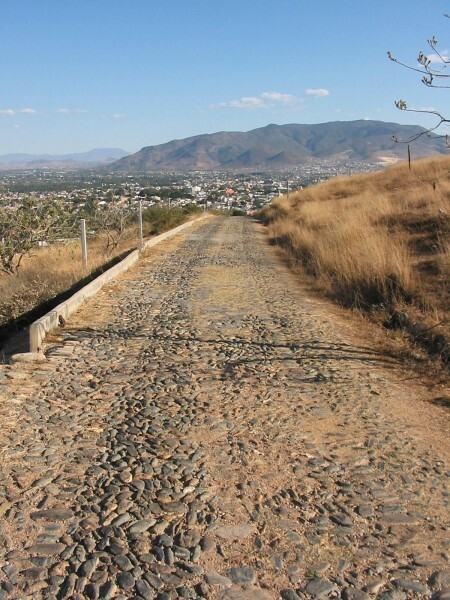 From the road you can see Monte Albán and views of the city and mountains.